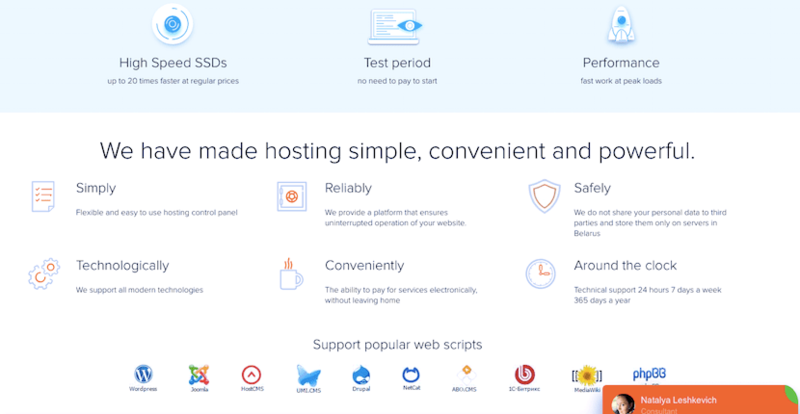 ActiveCloud Review 2019: Is ActiveCloud a Good Hosting? ActiveCloud has been in business since 2003. They are a leading Belarusian hosting provider with a good selection of Linux, Windows, and 1C-Bitrix plans. ActiveCloud has been in business since 2003 and currently has over 50,000 customers in Belarus and six countries of the Commonwealth of Independent States. On their customer list are several big names like Bosch, Mothercare, and Cadillac. Their service and support are available in Belarusian. ActiveCloud offers Linux and Windows shared hosting plans as well as hosting specifically for the 1C-Bitrix CMS. Their plans come with a decent array of features, even including credits to advertise on platforms such as Google Ads, Yandex.Direct, and UniSender. Users will also enjoy the provision of an SSL certificate and a one-click installer for an unspecified number of programs. Unusually, website backups are manual rather than automated and while they do have a website builder, it’s an added cost. You’ll find support for most scripting languages, such as PHP 5.4 – 7, Python 2.6, Perl 5.10, and SSI, along with ASP/.NET for the Windows plans. However, what I didn’t quite like were the number of databases and amount of storage included with their shared hosting plans. Essentially, users only get one database and one or two gigs of storage per domain, so even if you’re on the highest-tier plan, if you’ve maxed out your domain allowance you’ll only have 1GB of storage and a single database to work with for each of your websites. They have an uptime SLA of 99.95% for shared hosting and although it’s not advertised on their website, their live chat operator confirmed that their servers are co-located in a data center in Minsk, Belarus. This is a Tier III data center, which means less than 1.6 hours of downtime per year and a minimum of 72 hours of power outage protection. Their prices are listed in Belarusian Rubles and are well within market range. They also offer credits towards ad spend, which is a nice little value add. Make sure to take into account that while SSL certificates are included, domain registration is an added cost with them. While they don’t have a money back guarantee, they offer a ten-day free trial. You can also take advantage of their flexible monthly plans and discounted longer terms. In fact, you can purchase their plans in one, two, three, four, five, six, 12, and 24-month terms. There is a 10% discount for annual plans and a 20% discount for biennial terms. Customer service is available via telephone, email, and live chat. The business hours for sales are Monday through Thursday from 9:00 AM to 6.00 PM and Friday from 9:00 AM to 4:45 PM. Technical support is available 24/7/365. They also have a large knowledge base and FAQ section on their website. I have to say, I’ve chatted with them several times on live chat to ask about various technical details, and each and every time I’ve spoken with them, they’ve been prompt, friendly, and very helpful. ActiveCloud is one of the leading Belarusian hosting providers with numerous certificates and awards to their name. Customers looking for reliable servers located in Belarus will not be disappointed. Wondering how ActiveCloud stacks up against other Web Hosting companies? Enter any other Web Hosting company and we will give you a side-by-side comparison.